While we’re all in the Krishna mood, this might be the perfect time to relate an account of an instance of deception that I discovered while still a devotee. Even now that I am no longer a devotee, this still serves to show the vociferous reactions of Sai Baba followers to this affair. Sometime around the year 2000, I read a post on the (now offline) Sai Unity yahoo group about a certain Australian devotee, ‘Luther Christ’, who had visited Puttaparthi sometime in the 1980s, and who took photos of Sai Baba during darshan times. Upon returning to Australia and subsequently developing the photos, he was surprised to find that one of them was a miraculous picture of “Sai Krishna”, a photo of Sai Baba as Krishna! This photo was attached with the post for all to see. As usual, several devotees on that forum thanked the poster for allowing them to partake of such grace as well as be in possession of this photo. The only problem with this story was that I immediately recognised that this photo was a complete fake. It was not just the fact that it was an incredibly poor effort but that the background was similar to a painting of Krishna done by ISKCON artists. Since I have a long background with ISKCON I was able to recognise it immediately. In the “Sai Krishna” version, the blue of Sai Baba’s face is markedly different to the blue of the arms and the edges of the photo are rather conveniently blacked out. However, a gopi in the corner can be seen clearly. To double-check, I visited the galleries of various ISKCON-oriented websites as well as look in my old picture collection only to find that my guess was correct: the picture was indeed from ISKCON. When I was thus armed with indisputable evidence of fraud and voiced these objections on the forum, there appeared to be no real reply except for one particularly long-winded rationalisation as to why we should accept the “Sai Krishna” photo as a genuine miracle. The explanation went something like this: “It is probably Swami’s will that those who need to see him this way will see him in that way. We do not need to concern ourselves whether this photo is fake or not.” With this type of logic, one can get away with anything under the sun. The devotees did not really seem to care that a fraud had been perpetrated and that they were guilty of blindly swallowing yet another inscrutable leela of Swami’s. Perhaps they were too embarrassed to admit it? Since I had only made claims, I was asked by a more honest devotee in private to prove such claims by supplying him with the original ISKCON picture. This I did, and he promptly declared on the (also now offline) Unity In Diversity yahoogroup that he was in possession of the original picture and that I was able to support my claims of fraud. Even then, there was no real retraction of the picture or the accompanying story from the forum archives by any member or moderator. The next part of this story occurred when I had left the organisation of Sai Baba and also given up my adoration and worship of him. Funny how the tables turn when you are on the other side; there seems to be an immediate air of distrust, suspiciousness, and plain ol’ hostility. This type of treatment may be par for the course in material organisations, but to receive it from people who are supposedly of a spiritual bent of mind is a shock to the system. Even with all their wacky beliefs you’d think that Sai devotees would show some concern/compassion/sympathy for former members of the “Sai Family” who have fallen away by the wayside, but no, you are guilty of the biggest sin on earth. Where’s the proof? You guys always talk a lot of crap but you NEVER have any actual evidence to back it up. It’s ALL talk. Still talk and NO proof. Erm, I had just informed LDW that the “proof” was to be found in the archives of Sai Unity. Moreover, since I happened to know that LDW was actually a lazy individual who needed all information on a plate, I took the responsibility of looking up the exact posts on the Sai Unity group and posting them all so that everyone could see the relevant exchanges. In retrospect, I wish that I had downloaded those particular postings instead of just posting links to them, considering that Sai Unity is now offline and none of the Internet Archive engines seem to have kept cached copies of the necessary postings. In any case, however, at the time it was real and true that the messages at hand could be seen by all and sundry. Unless you can put the photos side by side so people can see for themselves it is NOT proof. Duhhhh. At the time of writing, Yahoo discussion groups do not allow messages to have their attachments saved. This means that if somebody in a discussion group wishes to post a picture to the group members, only the members at the time of posting will receive the picture; the picture is not available for download at a later date. However, at the time this discussion was taking place, Yahoo Groups did allow attachments to be saved and thus we can see how absurd LDW’s contention is, considering that I had already provided direct links to the postings at hand which contained the necessary pictures to download. All LDW had to do was see the postings, download the attached pictures and then view them side-by-side for herself to see the obvious fraud. Oddly, this simple process proved to be too difficult for her to carry out. I don’t belive [sic] anythig [sic] unless I see evidence. And esecially [sic] here since I’ve seen such manipulation on your side myself. Let’s keep in mind that I had just (twice!) mentioned that the material was available as well as providing the direct links to the posts at hand, which had the photos attached for anyone to download and see for themselves. Even if there was a reason to be suspicious based on similar issues with photographic fakes, this was completely unwarranted here considering that the pictures in question were freely available. Not just in postings, but on the Web too! In any case I figured that I had better respond to LDW’s claim of manipulation, and I simply related that these exchanges had taken place while I was still a Sai devotee discussing the issue with fellow devotees. As a devotee, I had nothing to lose by pointing out this photographic fraud. To have the fraud confirmed by a fellow devotee after I sent him a copy of the original ISKCON photo proved that other people had recognised it, even if some of them tried to justify it with a “Swami wills everything” explanation. I also pointed out that since fellow Sai devotees had seen both the pictures and admitted that the “Sai Krishna” picture was a fake after considering the evidence, this put LDW’s own claim into doubt since she claimed not to believe anything without evidence. One has to wonder why she failed to see what her fellow devotees could see in the plain and clear light of day. Even if it is so that the two pictures need to be seen for themselves, side-by-side, here they are. See the difference! In another post I provided a commentary on both the photos. 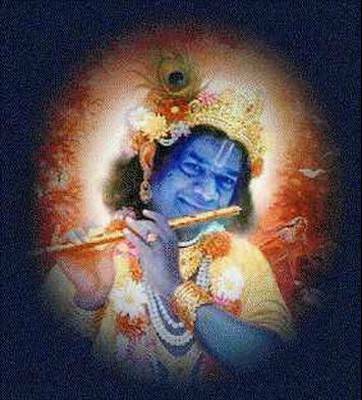 Regarding the “Sai Krishna” version, I noted how convenient it was for the edges of the photo to be blacked out. I speculated that this could be because the producer of this photo wanted to erase as much of the original picture as possible just in case anybody recognised it as an ISKCON picture. Even with the considerable blackout, a gopi can be seen clearly. Also, the colour of the face is different from that of the arms. In the ISKCON edition, the full picture can be seen (wonder of wonders! 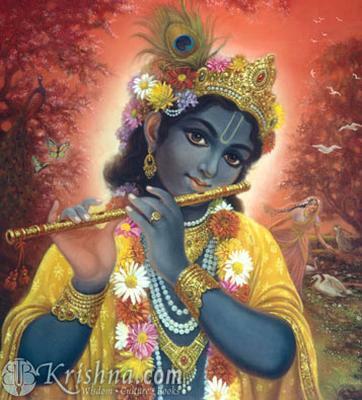 ), the colour of Krishna’s face and arms is consistent and the gopi can be fully seen. If that isn’t obvious enough, I don’t know what is. To erase all doubt, I posted both the pictures in the ‘Photos’ section of the club just in case anyone else – in the future – would ridiculously attempt to argue that both the pictures should be seen side-by-side. I then penned a post concluding that, considering all of the available evidence that was plain for all to see, it is obvious that the “Sai Krishna miracle photo” is a proven fraud and should be treated as such. Of course I also noted how LDW seemed to have no comment on the matter, which was hardly surprising. Connie showed Baba the recent photo making the rounds and asked if the so-called Krishna photo with Baba’s face on it were legitimate, as it looked very suspicious to her and she suspected it was a computer rendering with a fraudulent story attached to the photo re its origen[sic]. Baba said, “This is artificial. It is (like a) painting.” Connie asked, “You mean, as on the computer, Swami?” Baba replied, “Yes, I don’t like artificial (things). He tossed it down. Connie thanked Him for confirming it. The truth is that probably someone like you from ISKCON created the fake in an attempt to discredit Sai Baba. Just think, he knows who it is. Conveniently forgetting that I was a Sai devotee at the time this all took place on the Sai Unity group, the entire incident shows that I had nothing to lose (or gain) by testifying that this picture was a fraud. In fact, I could have kept quiet and allowed my fellow devotees to delude themselves that this was a miracle picture. “Wow! Sai Baba shows himself as Krishna! Wow wow!” It only showed that I have a great love for the truth and I cannot stand to see untruth reign, even if it meant sacrificing the credibility of my then guru. And truth will always reveal itself. - This issue had been discussed and resolved on the Sai Unity group. - I provided direct links to the posts (and attachments) at hand. - I uploaded them to the ‘Photos’ section for all to see for themselves. - I commented on the inconsistencies of the photos. - Sai Baba himself apparently confirmed that this photo was a fake. You’re the one who’s brainwashed. You can ONLY view things from ONE perspective because you are so brainwashed by your OWN stupidity. Facts don’t matter to you because you love your lies. You’re so perverted you think it’s funny people might die as long as it’s for a good cause you slimey [sic] piece of mud. This picture has surfaced again, this time attached with a different story. It is a source of constant bewilderment to me how Sai devotees thoughtlessly and recklessly indulge in mischievous propaganda in order to uplift the flagging profile of their ailing guru.